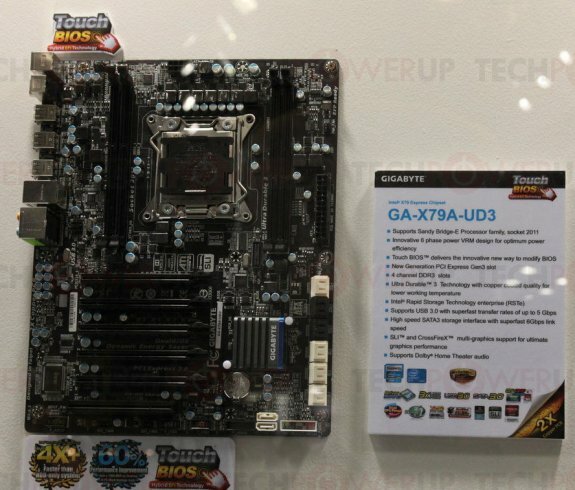 TPU photographed Gigabyte's X79 UD3 motherboard at Computex 2011. This mainboard is designed for Intel LGA2011 processors and uses the Intel X79 chipset, which is expected to arrive in Q4 2011. There are five PCIe x16 slots, ten SATA 6Gbps ports and a couple of USB 3.0 ports. The GA-X79A-UD3 is a standard ATX sized motherboard. Its main VRM is spread all around the large CPU socket, in what appears to be a 6-phase design, with an unknown number of memory and uncore phases. LGA2011 processors feature a large quad-channel DDR3 memory controller, along with a northbridge uncore component with a 40-lane PCI-Express 3.0 controller. Those amount to the socket's insane pin-count of 2,011 pins. Memory slots are located in pairs of two on either sides of the socket. Each slot is its own 64-bit wide memory channel.